This Body Mass Index Chart (BMI chart) is made using the CDC guidelines. By following your weight and height you can find your BMI. You can also quickly see which category you fall into. You can also use these categories as goals. Step by step, goal by goal, you can go from morbidly obese to obese to overweight to healthy. 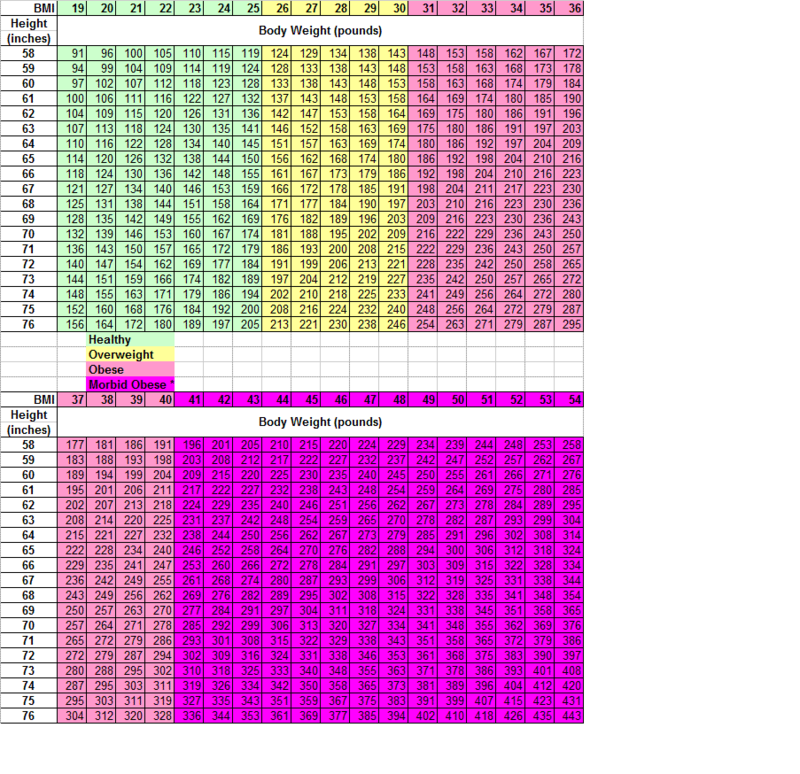 So that it could be easily read, I put the body mass index chart on two pages. A word of caution. This information is just a rough guideline. A doctor would also look at other factors such as ability to breath and sleep at night, circulation, heart condition... to determine these various levels. This chart also rounded numbers to the nearest whole number. Some people think that only skinny people can be on this BMI chart, but see what John Barban has to say about BMI Charts. Body Mass Index Chart Plus Four other Ideal Weight Charts. Go here if you want to learn more about the body mass index formula. If you are having problems with the chart and want to use a calculator, go here to calculate ideal weight based on a BMI chart. If your weight is on this body mass index chart you may very well be considered obese and need to lose some weight. Do not feel alone, I need to lose weight again. Just remember that BMI is only an estimate, if you are in really good athletic shape you may not be obese. (Even athletes may weight too much as even muscle can put an extra load on the body.) If you feel that you may be athletic, look at some of the information on this web site that deals with % fat and body measurements. Ok for all you people from outside the US, I have a chart for you below. The idea is the same. You want to be in the green. Or at least most people want to be in the green.